Broadcast industry regulator Ofcom has announced that product placement will be allowed in UK TV programmes from 28 February 2011. The rules for paid-for references on radio broadcasts have also been revised. This entry was posted in Advertising, Broadcasting, Business, Editors' pick and tagged Advertising, Business, Ofcom, paid content, product placement, radio, television, TV on December 20, 2010 by Laura Oliver. Reuters reports on plans by Microsoft to create a new subscription-based TV service available via its Xbox console. According to Reuters’ sources, talks have been held with TV networks about a product to rival plans by Google and other new media companies to move into TV. The service would charge a monthly fee for access through the Xbox to networks such as ABC, NBC, Fox, CBS, ESPN or CNN, according to two sources familiar with the plans. This entry was posted in Broadcasting, Editors' pick and tagged IPTV, microsoft, technology, TV, xbox on November 30, 2010 by Laura Oliver. As plans in the UK for greater sharing of resources between ITV, the BBC and other agencies are developed, here are some pointers from across the pond on the pros and cons of sharing news video. In a time of strapped resources, will news video sharing become the norm and could it help to boost local news on TV and the web? This entry was posted in Broadcasting, Editors' pick, Multimedia and tagged BBC, Deborah Potter, ITV, TV, United Kingdom, Video on June 11, 2009 by Laura Oliver. Cory Bergman offers eight tips for local TV sites to capitalise on the ailing local newspaper industry including forming partnerships with local blog and independent publishers and ‘aggregate when you can’t host’. This entry was posted in Broadcasting, Editors' pick and tagged Cory Bergman, TV on February 6, 2009 by Laura Oliver. Online advertising is going to overtake radio in the advertising market, MediaGuardian reported today. Richard Wray’s article stated that while Carat – part of the Aegis marketing empire – had reduced its forecasts for the global advertising markets for 2008/9, it also said online advertising will continue to grow, overtaking radio as the third most popular advertising medium after TV and newspapers and magazines. MediaGuardian’s report is interesting to look at in the light of statistics made available last week by the Online Publishers Association (OPA). The US-based figures suggest that ‘consumers on all three types of local media sites – newspapers, television stations and magazines – are more likely to take action after viewing a local advert than visitors on all other local content sites’. Click here to view the full report and follow this link for the press release. 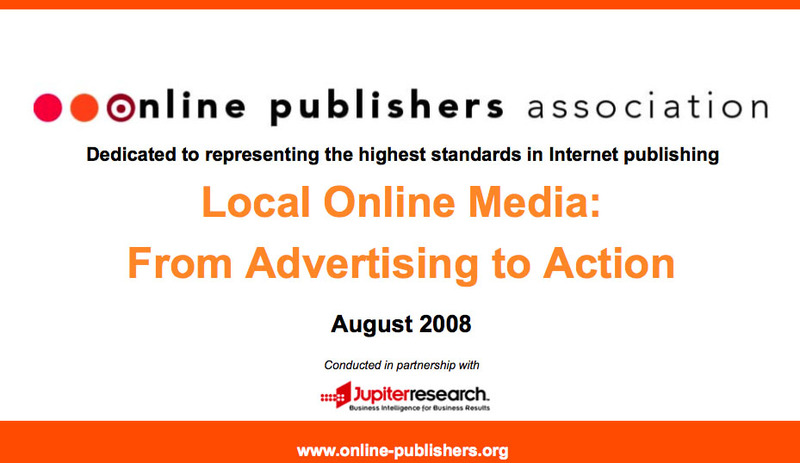 This entry was posted in Journalism and tagged advertising market, advertising markets, advertising medium, Association of Online Publishers, JupiterResearch, Local Magazine, local media sites, Media Guardian, online advertising, online consumers, Online Content Users, online publishers, Online Publishers Association, Richard Kray, Richard Wray, slow advertising market, the Aegis, TV, United States, us on August 28, 2008 by Judith Townend.